We’re here for Rent the Runway’s newest project. As much as we understand the joy a seasonal refresh can bring, it’s impractical to suggest that people simply pick up a whole new interior space every month. Home revamps are expensive—not to mention environmentally dodgy due to all the waste they produce. 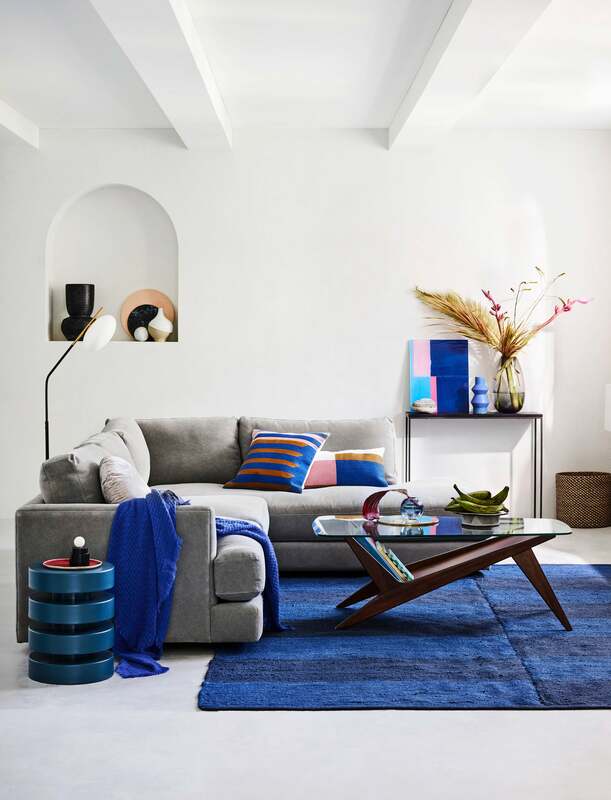 Which is why this latest collaboration is such a genius idea: West Elm is partnering with Rent the Runway to launch a series of rentable decor bundles for the bedroom and living room. It’s the fickle decorator’s dream. The program follows the same business model as Rent the Runway’s regular clothing service. Here’s how it works: Using your Rent the Runway Unlimited or Update subscription, choose from the 26 decor bundles available. You can keep your temporary pieces anywhere from a couple of weeks to months, and should you find yourself unable to part with your new geometric-print throw pillows, you’ll have the option to buy the bundle at a discounted rate. Each bundle was carefully curated by West Elm and includes a mix of new and seasonal products. Bedroom bundles include a quilt, coverlet, throw, blanket, shams, and decorative pillows; living room bundles include a pairing of throw pillows and/or a throw. Best of all, the collaboration is customizable, so customers will have an array of styles and pieces to choose from. Aside from renters or indecisive decorators, another demographic that will find this upcoming collaboration super appealing is new homeowners. After all, the struggle of outfitting a new place stems from uncertainty. Can’t decide between classic neutrals or vibrant prints? Try them each out over the span of a week to see how the styles interact with your space before committing full-time. But perhaps the most interesting part of the West Elm x Rent the Runway partnership is what it indicates about a shifting retail landscape—one that can no longer ignore the very real demands of sustainability but ultimately still favors a more “fast furniture” business model. Sustainability has long been at the crux of both brands’ philosophies. If this model is successful (which, let’s be real, we’re already certain it will be), it can signal the advent of a new form of responsible design consumerism: renting. It’s definitely a movement: Other huge brands like IKEA are already on board with testing rental furniture. Plus, with rental products this chic, who needs to buy? The West Elm x Rent the Runway decor rental service will officially be available to subscribers in early June. Ahead of the launch, take a peek at some of our favorite West Elm pieces that will be offered in the bundles, below.